Digimon: System Restore: Data Squad Episode 43: Justice Equals Power! To think there actually was a point where BanchoLeomon told everybody never to use the Burst Mode. We all knew Marcus was going to do it. He's the gogglehead and he's just defiant and awesome like that. Thomas doing it was a cool little touch, giving some closure to a pretty sweet character and acknowledging his power in a series that often sold him short. Yoshi and Keenan, however, are genuine surprises in an episode that we really didn't need, but are very glad to have. The common complaint with Frontier is the way Takuya and Koji evolve so much further than the other four. This is unfair only in the sense that every season has this imbalance. It's only most pronounced and least justified in Frontier. Data Squad is the exact opposite- the disparity is the least pronounced, yet the most justified. Nobody expects Yushima, Miki and Megumi to go Mega; hell, we're stoked that they went Ultimate. Yoshi and Keenan deserved to go Mega, and we're glad they did, but Burst Mode? Keenan's character arc has been wrapped up for a while now and Yoshi didn't really have one at all. There would have been no shame in letting them fall back. They'd still land higher than Sora, Izzy, Mimi and Joe. So what sort of cheap contrivance is manufactured to generate enough emotion to lift these two into the limelight? A freaking adorable cheap contrivance, that's what! Just as the Digital World's proximity is screwing with the environment in the real world, the reverse is also true and a bunch of cute little baby (and In-Training) Digimon drop into Sarah's backyard. Biyomon is with them, of course, because of all the places for him to randomly land in the entire world, it's the one place where he had friends in a past life. Oh, it's a contrivance of the cheapest level, but damned if it's not enjoyable and offers one last hurrah for these characters. Seeing all the runts away from their home and making the most out of Sarah's hospitality gives Keenan all sorts of fuzzies. He's been part of the team for so long that it's a good reminder of where he started. Once he was lost and relied on the Damon household, and this brings him back full circle. Yoshi, the serviceable Data Squad officer since day one, never got that sort of plotline, and it'll go down as a disappointment that so little was done with a character in such a unique position. At the same time, for someone who towed the company line and remained wary of the creatures she was “protecting,” she's grown awfully comfortable with the little guys, enjoying their presence one moment but never shying away from discipline. She's also willing to go to extreme lengths to help them out, happy to play domestic with Sarah and Kristy. Lalamon makes it clear that Yoshi is happy to play domestic, but would never be one in real life. The villain of the week determined to interfere with such cuteness is Leopardmon. Rather than include him in the initial roster or send one of the Royal Knights that were introduced, he shows up and blows up in a blink. It's very odd as King Drasil and Craniumon talk up his attitude and how things must have gotten personal for him to get involved. Given that destroying the human world should probably be an “all hands on deck” job, it's strange that Leopardmon only now decides to participate, and King Drasil seems okay with this. All that talk about justice, power and righteous inequality suggests that Leopardmon was supposed to be more involved in the story and not offed immediately. 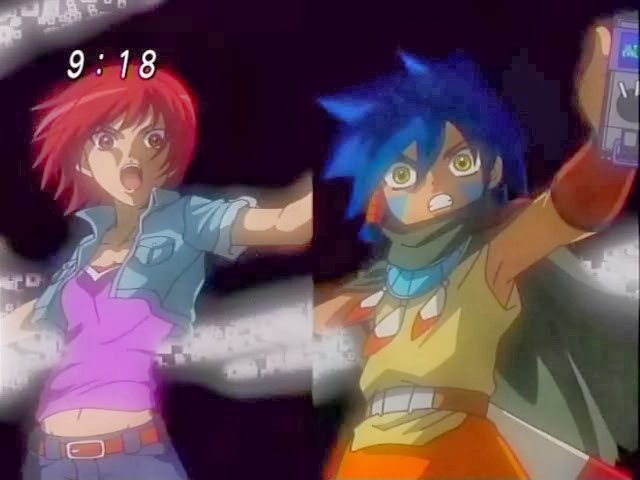 But because he was, by two characters that we didn't need Burst Mode from, it makes the episode completely frivolous. And yet, as meaningless as it ended up being, it couldn't be more appreciated. Yoshi makes reference to DATS divisions around the world trying to contain the Royal Knights. This implies that not only are there international Data Squads, but that they weren't disbanded when the “Digimon threat” soured the idea of DATS and that their members are capable of doing anything against the Royal Knights. At best, they wouldn't be any stronger than Miki and Megumi and somehow they're not being totally wiped. Lalamon's constant swipes at Yoshi's lack of housekeeping ability (effort might be the more appropriate word) is one of the most underrated things about this season. She's up there with Gomamon in terms of taking playful swipes at his/her partner. Guardromon sneaks up there too. Sarah, meanwhile, must be the greatest damn domestic in the world making a sumptuous dinner out of emergency rations. 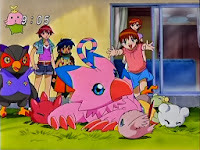 Even the regenerated Biyomon has a deal of character growth. He doesn't remember Kristy, so the key to his evolution is not only protecting her, but protecting Sarah and all the Digimon in the house.